Finally the day has arrived! The Tour of California started today. 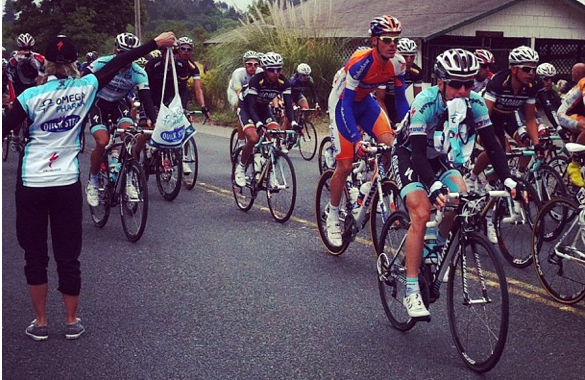 126 riders at this moment are racing over the hills of Santa Rosa. We are able to see the Live video coverage up now! Every day the last 2-hours of each stage will be aired for all to see FREE on Tour Tracker, as well as on NBC Sports Network. I am happy to be listening to the voices of Paul Sherwen and Phil Liggett again. Most days the live video coverage will begin at 2pm (PDT). For all those who enjoy watching cycling on TV to watch the beautiful scenery roll by on a HD TV screen, or to imagine cycling or driving along a road other than the one out your front door. Tune in, the announcers always seem to make the state of California (my home state) sound and look amazing. For all those who plan to come out for a day, or several days to watch the tour as a fan, remember every single one of you matters in supporting this race, and every single one of you will be in the best place to see the race. It is the known phenomenon of being a cycling fan. "We were at the best place"
The most common comment I hear from fans after a race is they were in the best place to see the race. Every one. They might have been at the start, on a mountain, sitting under a tent with a BBQ grill roadside, in a VIP area, at the finish line, or waiting outside a team bus for an hour for that one glimpse of George Hincapie. But they swear they were in the best place on race day. Come to the race, make it your own, whatever experience you have will be an excellent one. Live written updates: Tour Tracker, and also on CyclingNews.com (from the start to the finish with commnetary by Charles Pelkey) at Amgen Tour of California 2012 scroll down and select Live Coverage Now from the left column under each Stage number.